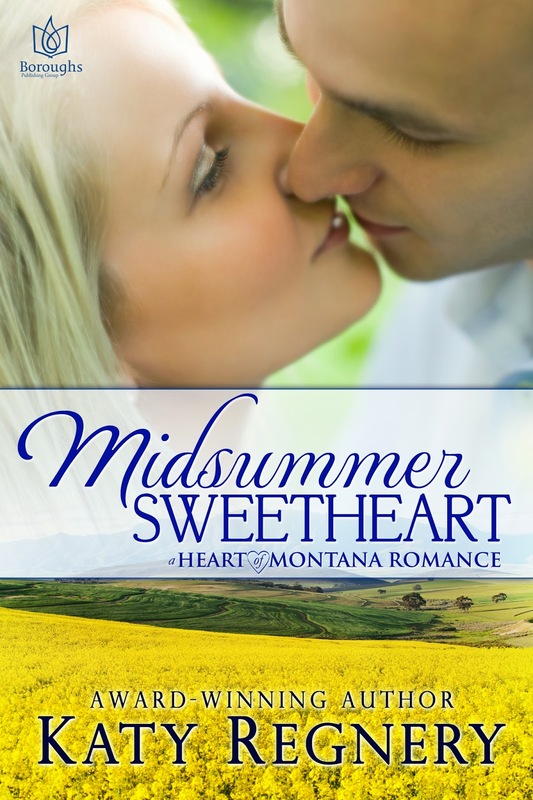 My review: Aah the romance of Montana summers. This was such a satisfying read. Katrin and Erik complemented each other perfectly: he being exaggerated in size and power, but gentle in spirit; and she being small in stature but powerful in her convictions. 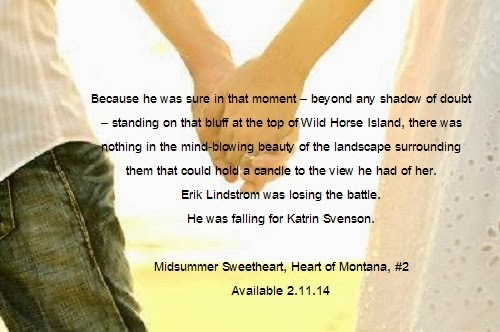 My favorite parts of the novel were Katrin and Erik’s dates. Full of banter and flirtation, lots of conversation, and swoony hand-holding, the picnics and walks and drives felt so real to me. I’ll be honest, the beginning of the book was awkward. The dialogue was forced, the writing was repetitive, and I felt like I was reading a soap opera. Then at about chapter 5, the writing tightened up and Regnery found a groove. I was pulled in emotionally and intellectually. I was IN Montana. The suspense was awesome, and the love story had me sighing dreamily. 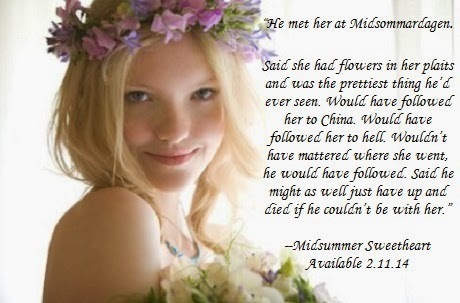 Though Regnery might have had difficulty with the beginning of Midsummer Sweetheart, she sure has a wonderful way with endings. This happily ever after was sweet, and perfect. As a language lover, I REALLY had fun reading (ok and trying to pronounce!) the Swedish and Norwegian endearments. Thank you, Miss Katy! This review was posted on Amazon and goodreads on 22 February. scheduled for a Winter 2014 release. Purchasing Links ==> will be provided when they become available. Wow! Playing for Love at Deep Haven is INTENSE. Like, Falling fast and hard in love with your soulmate intense. And Kept these feelings buried for a decade and now they are at the surface all at once intense. And I ran away from myself a long time ago and now I want me back intense. This book is like a musical composition that increases in intensity and volume until you all of a sudden find the book at forte and then fortissimo. When you think you’re hearing the biggest music you’ve ever heard, it quiets. Until Crescendo. Fortississimo. Amazing. Violet made me remember what it’s like to be yourself when you’re not trying to meet other people’s expectations. Zach made me realize that not everyone knows how to be loved. I so wanted to know what happened next that I was reading as fast as can be, but then everything I read was so good that I’d go back and re-read to make sure I didn’t miss anything. I was in it 100%. I was inside Zach and Aubrey’s heads. I could hear the music, I could anticipate the poetry. I identified with the characters’ feelings, and I cried. Decrescendo. Piano. Pianissimo. Fine. 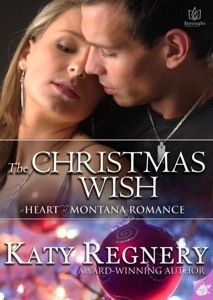 This charming romance novel revolves around Jenny, a small town Montana girl from a close-knit family, and Sam, a work-hard-play-hard corporate guy who lives in Chicago but has Montana family ties. Jenny and Sam agree to help their loved ones get married from afar by standing in for them by proxy. While they wait for their courtroom appointment, they have a few days to get to know each other. I’ll let you read for yourself how THAT goes. There’s quite a bit of personal growth, family loyalty, snowy fun, and new love in there … and a happily ever after, too. The first few chapters were a little awkward to read. But the awkward writing mimicked the discomfort of Sam and Jenny as they felt each other out and determined how their feelings were going to play out. The writing became smoother and more natural as Jenny and Sam became more comfortable with each other. I indeed sighed at Sam’s romantic moments, clenched my fists with Jenny when she was frustrated, and felt my shoulders tense when another guy tried to make a move on Jenny. Katy Regnery sparked more interest with snippets of Swedish… little phrases that I am going to practice so I can use them when the right moment presents itself. And I had fun strolling with the loving couple, talking Glogg and enjoying the Christmassy atmosphere. I totally loved that By Proxy didn’t try to be flashy or dramatic, but it still made me laugh and cry. Real tears, people! I felt for these characters. And I’m all in for the next book in this Heart of Montana series.